You’ve given me yet another reason to visit Florida, I’d live to see one if the butterflies in person. I had no idea they were so common. They have such an exotic way of flitting about that entrances as if they knew we were watching their erratic yet graceful flower to flower dances. 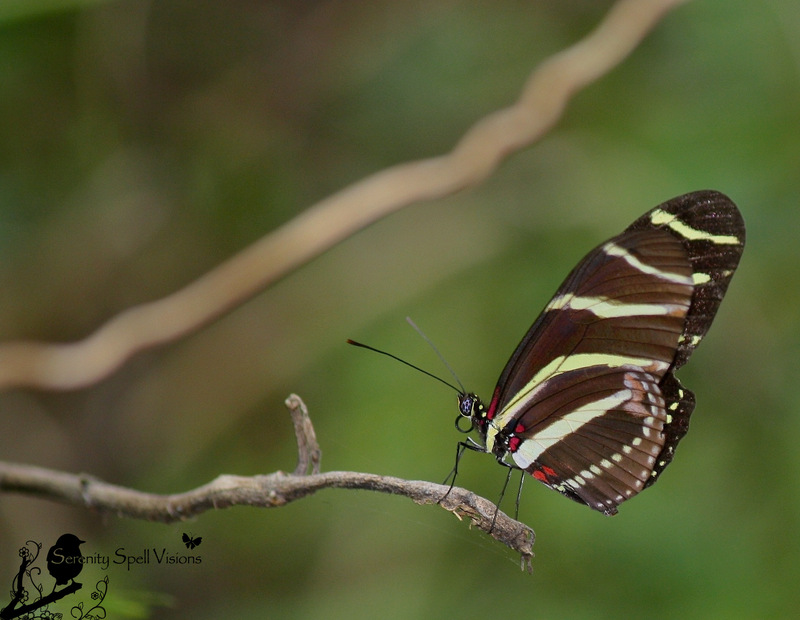 So,if I had to be a butterfly , I would to choose to be a Zebra Longwing!. At my old house , I made a frame over the garden gate and trained the Passion Flower vines to grow over it, looked gorgeous! Heeeeh! It is rather masculine… I’ve always thought that! Here is Central Florida we see them around, but not as often as you. That is amazing that they roost together at night! 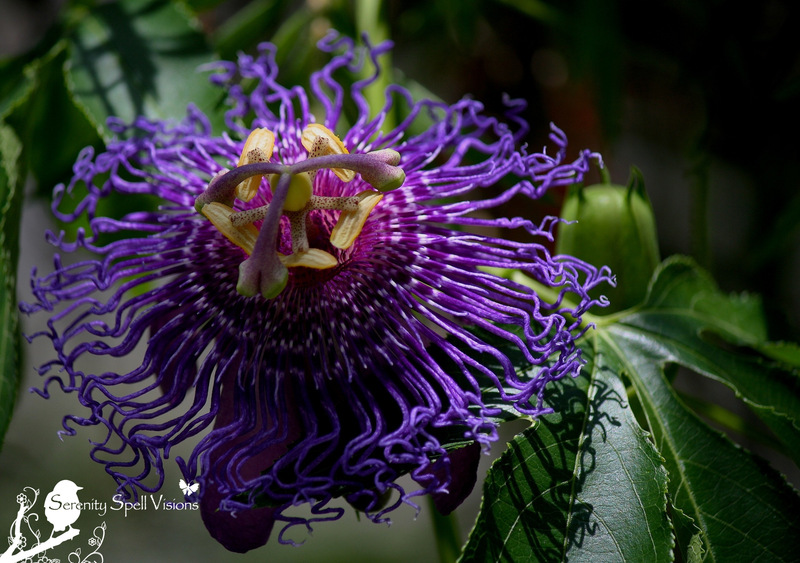 We’ve always loved passion flowers – got to plant a bunch this spring. I’ve seen groups of 2-3 begin the roosting process… But my shots were horrible, because the camera settings were askew (of course) in the darkness of the dusk hours and denseness of the hammocks. But I just didn’t realize what I was seeing… Or that it was a consistent thing, I guess! Such fascinating little creatures. And so sturdy! I tried planting passiflora once, years ago… And curiously, they didn’t take! All the other natives are going gangbusters. I SHALL try again, though. My butterflies (incl. the zebras) are loving all the others! Lovely, as usual and fascinating!! Ah, poor gal. They just can’t wait… 😀 In your first photo, I’m reminded of spider’s legs. She’s got great style. I know… Those poor girls! Argh!! I’ve been meaning to buy some passiflora tea for some time — there are just SO MANY benefits. And it’s yummy! I just need to find a good purchasing resource for it. If you find one, let me know — and likewise! Wow. Your gorgeous photos make me want to jump on a plane to Florida today! I’ve seen a similar-looking butterfly in tropical Mexico…except it has red bars on the wing. 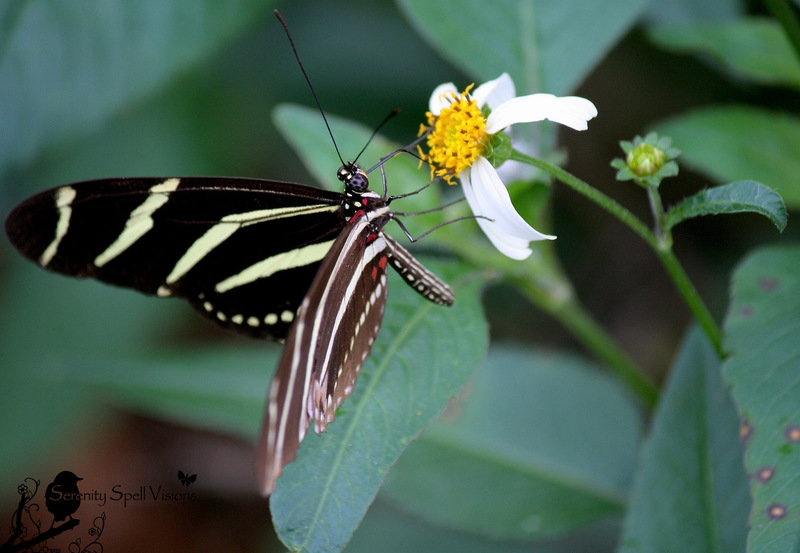 I wonder if those are related to the zebra longwing…how interesting that they can live so long. I love watching butterflies of all species feed – the way they probe the flower with their proboscis, then curl it up when they are done. Fascinating! As much as I see these lovely little flying zebras, this was a new fact for me, too — their long lifespans! Isn’t that fascinating (and their feeding habits)? They’re so tiny and delicate, and yet they can survive the elements for months on end. Hmmm…. I wonder what flutterby you saw? There are MANY that are interrelated. Was it a longwing too? A beautiful new post at Serenity Spell! Thanks so much for sharing our lovely little flying zebras! I don’t remember seeing these when I lived in Florida – so beautiful! 🙂 reblogged! I’m fortunate to see them daily, both in my little yard (I have several natives growing) and on hikes… but then again, I’m in the southern portion of the state. And I never tire of ’em! For you butterfly fans – here is a beauty from Serenity Spell! Without a doubt, these are the most gorgeous photos of this butterfly I’ve EVER seen! I will never forget the first time I saw them (last year in the Univ of FL St. Lucie County teaching garden,) fluttering all around me as we walked through the passiflora arborway. What an amazing experience! I adore these guys… I have them in my yard every day (several natives growing here), and I see them EVERYWHERE on my hikes. But of course, I’m in the south of FLA, heh. They’re always so wonderful to see!! I love these guys… As much as I see them, I never fail to tire of them. And I learned something new — six months of life! Can you believe it? Christina: Thanks for your thorough explanation on this Butterfly, I had not known it lived for so long. Great article. You’re so welcome! Thanks very much. As often as I see them… This was a brand-new fact for me, too! I had no idea — it’s pretty amazing that this delicate little thing has such a lifespan! Beautiful shots! I have been seeing these lately. They’re the only ones I’ve noticed in the last month or so. Absolutely beautiful shots. I am woefully unschooled in the clouds of butterflies, dragon flies and other flying critters (iow, bugs) – but I know great photography when I see it. Thanks! Beautiful Captures – thanks for sharing:) Happy Monday! I am so glad you are doing all this for FL. Having spent many years there on east and west coasts, criss-crossing the state, interning at Mote Marine, doing artwork, watching bugs, snakes and whatever was there in front of me and just loving it since 1966, preserving it through your awareness is what is needed. Thank you for doing what you do. A great post. Lots of good information and great photos too. Like everyone else I was not aware of their longevity and their roosting habit. I had seen the beginnings of their roosting behavior — badly captured due to bad camera settings, hah! — but their longevity, because of their unique diet, was equally new to me! So very fascinating. One of my favorite butterflies and we currently have a lot in our backyard. Great captures as well as those of the passion fruit flower. I love these guys… I have a very small yard, but I’ve planted lots of natives for our butterflies. 🙂 And of course, the flying zebras are VERY happy! Yesterday on a longish hike, I was mobbed by both them, as well as the Queens and Ruddy Daggerwings. So lovely. Hi, it’s me, Fork in My Eye! Very cool post. I’ve never seen a zebra longwing here in North Carolina (outside of the butterfly house and the life and science musem) but we do have passion flower. Isn’t it one of the coolest flowers you’ve ever seen? Fun to learn so much about it. Beautiful photos as usual. Ah, thanks so much! I’m glad you enjoyed and learned a bit about the passiflora… REALLY beautiful and integral vine / flower. I need to buy that tea before I forget, lol. Nature is truly amazing, as always. Thanks for the info. And great pictures of butterfly and flower. Love that last flower picture. Maybe I’ll get my hair done like that (color and style)!! Thanks so much — I’m glad you enjoyed! Hahahah, LOVE IT! I say do it. I just had a bit of teal in my hair (for about 3 months), and I realllly enjoyed it. I was actually thinking of purple, next. When my brother worked in Vienna, I was lucky enough to visit him… And I was amazed at everyone’s hair color. The most elegant women, of all ages — from 20 to 90 — in their Chanel and Prada…. with purple, maroon, crazy hair! I loved it. Wonderful colors on those passion flowers! Beautiful shots! Wow! The Passion flowers are amazing! I’ve never seen anything like them. Nice job! Beautiful flowers and butterflies sure do go together! Wonderful photos! wow wow and more wow! These shots are stunning – that first one is just amazing! Such a beauty! And your wonderfull photos reminds me there might be a summer eventually, but probably not as summery as this.. Thanks so much! As much as I see these lovelies, I’m always entranced by their presence in our swamps, wetlands, and woods. They’re so bright and beautiful — and sturdy little things! Ah yes… We are a bit warmer than you, eh? But I would love to see your land. It’s exceptionally beautiful, especially as you document it. Oooh, fun. I remember my first wild zebra longwings, in Everglades. I saw them within a week of seeing some in a butterfly exhibit at the American Museum of Natural History in NYC. I have some pictures, but all my butterflies had tattered wings, so they don’t look quite as lovely as yours! Interesting question! In our area — the more southern part of the state — that definitely doesn’t seem to be the case. I’ve seen lovely specimens in the winter months, as well…. But our weather can remain incredibly warm all year. For example: 80 degrees yesterday! The Native Floridians, myself included, are NOT thrilled. It tickled me to see you talk about “flutterbys” – that’s what I called them when I was a kid! And I may give passion flower in a pot a try this year. I have some Cape Honeysuckles that have been doing very well on a breezeway – if there’s enough sun for them, there should be for passion flower. I think I’ve been hanging around your blog longer than I realized. Last week I dreamed I was at my (long-dead) aunt’s house, a little white frame midwestern number. Some of us were going somewhere, and when I went out to get the car, there were five – count ’em! – five alligators! Two were by the side door, two were on the roof, and one was in the garden side of the house. There were two huge red iguanas, too – they looked like red patent leather. No threat, no problem – they just were hanging out. I woke up laughing, and thinking about you! Stunning butterfly and gorgeous pictures as always. Thanks so much — I never tire of seeing these lovelies…. A low mound or ridge of earth; a knoll. also ham·mock A tract of forested land that rises above an adjacent marsh in the southern United States. Now that I know, I can go lie down in my hammock and contemplate zebra longwing butterflies, which make it as far west as Texas, and which I’ve occasionally seen in Austin. A happy new and natural year to you. It’s a common ecosystem here, the hardwood hammock (as well as the tropical forest hammock, but I’ll save that for a later day). Thanks you, a wonderfully happy and natural new year to you as well — may it be filled with the most bright and beautiful flowers! This is just funny – there’s more hammock talk over at my new post! Yes, ma’am, I wrote about Florida. If you see anything that’s wrong, be sure and let me know! Oh YAYAYAY! I can’t wait to read it… I’m running a wee bit behind (with everything in life these days), and knowing your pieces, I imagine there’s not a shred of inconsistency, are you kidding? AH, I cried when that magnificent tree perished — at such stupidity. I’m still in awe of the event. Just cannot…fathom. Thanks so very much! This land and its creatures have so much to offer, for sure — and I hope that efforts will continue, and grow, to protect them. The story about the female butterfly coming out of her cocoon attracting mates reminds me of a debutant coming out. I imagine it’s just as colorful too. I had no idea passionflower had so many uses. 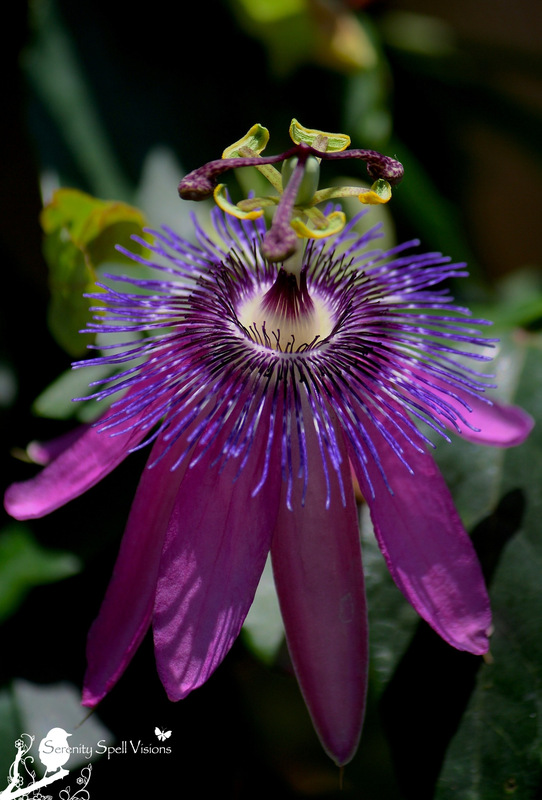 I have taken passionflower tinctures and teas for a sleep aid and I think I have also used it as a muscle relaxer. Heh, love it – the debutante!! Colorful and a tad early, but so very true. The passionflower really is amazing… And you’ve been using it exactly as it’s intended! So many uses, so many benefits. Thanks for the reminder; I need to find a good source ASAP. 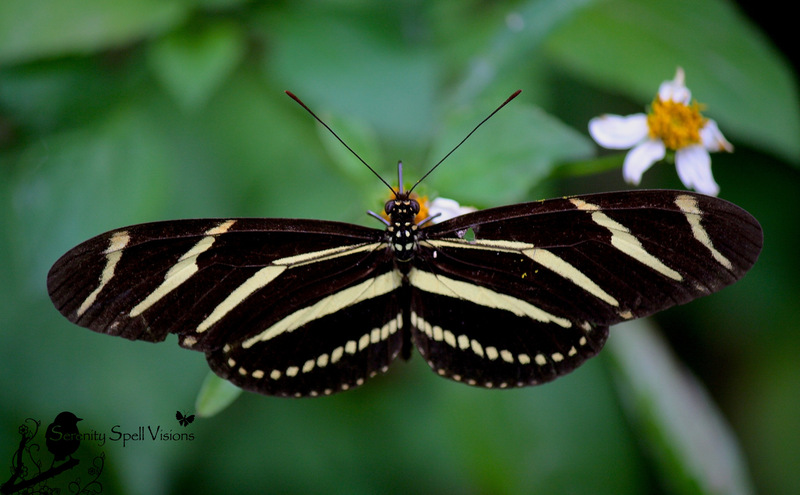 I know of zebra finches and zebra fish, but of course there must be a zebra butterfly too! Dear FeyGirl- Wonderful topic and photographs! As a monarch waystation monitor here in Virginia, I know how difficult it is to capture these beauties on camera! Kudos! AND, a little recipe for those of you growing a Passion Flower vine in your yard–those bulbous pods contain many seeds that when placed into a bottle of good vodka, infuses the MOST WONDERFUL flavor into the liquor. Store vodka in freezer and enjoy! Thanks so very much! I adore our butterflies… I chase them incessantly! The most dangerous part? Watching out for the alligators as I chase them to the water’s edge, to photograph them! Heh! WOW! Thank you SO MUCH for this little recipe!! How wonderful!!! See, you get the benefits of the passion flower…and vodka! 🙂 I’m definitely trying this!!! Absolutely beautiful! It’s so difficult to capture a butterfly in a photo! I’ve always been so lucky with our flutterbys… Especially these guys!